The new wordmark plays off that CSUN is an acronym that can be pronounced, and how the sun is an apt metaphor for the light that knowledge sheds. Photo by Lee Choo. 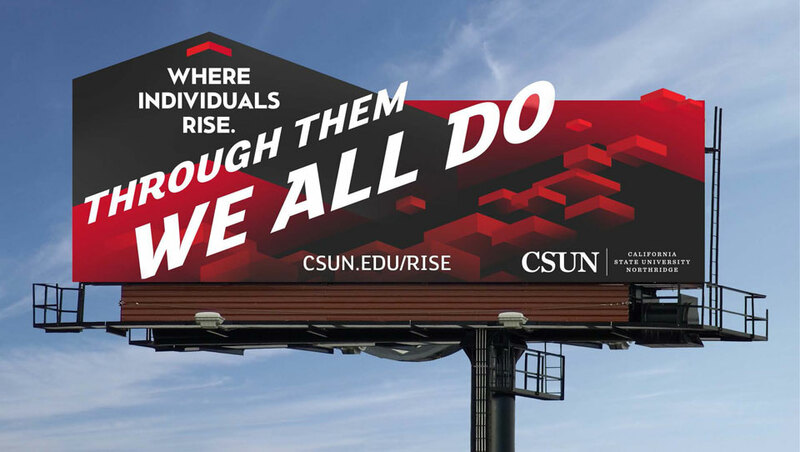 The new campaign focuses on how so many people see themselves rise through CSUN. Photo by Lee Choo. 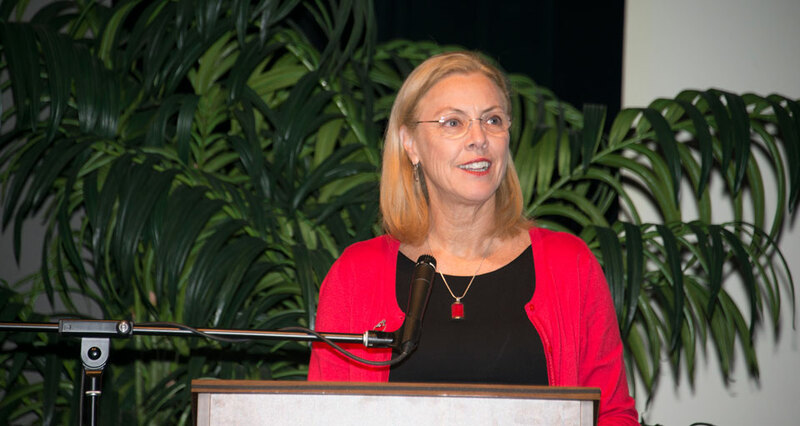 CSUN President Dianne F. Harrison kicked off the launch event talking about the new direction, and how it will have an elevating effect for the university's reputation and visibility. Photo by Lee Choo. CSUN's new reputation and visibility campaign introduced a new wordmark, brand guidelines, copy tone and more at a launch event at Plaza Del Sol in the University Student Union. Photo by Lee Choo. 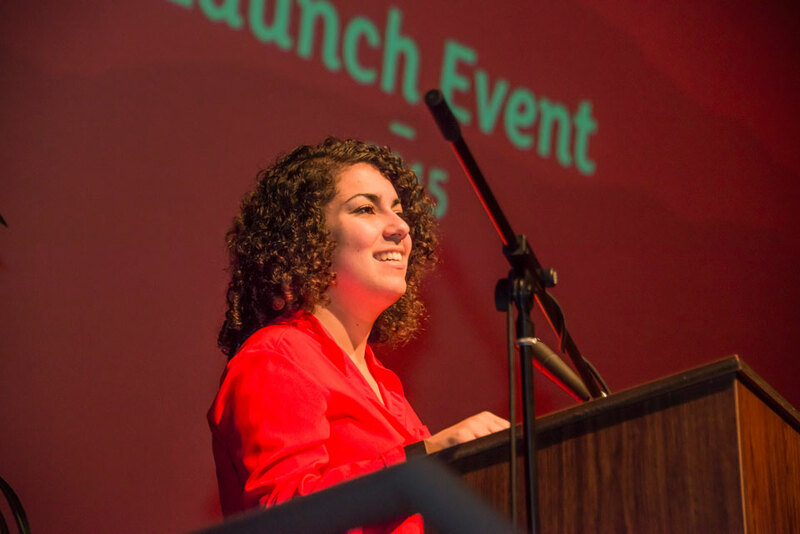 Talar Alexanian, CSUN's Associated Student vice president, spoke from the student perspective on how the new campaign will elevate the degrees for all CSUN alumni. Photo by Lee Choo. The moniker “CSUN” has been used to refer to California State University, Northridge since the early 1970s. Today, CSUN formally launched a new graphic identity that embraces that acronym and unveiled a new visibility campaign to elevate the university’s reputation and visibility. Faculty, staff, students and alumni leaders viewed the new graphic direction and messaging platform during two presentations in CSUN’s Plaza del Sol Theatre. Campus officials shared examples of the visibility campaign that will launch in early May. The work strongly embraced the CSUN name. All of the work highlighted at the launch event grew from a vigorous discovery and creative process that involved students, faculty, staff, alumni, donors and the business community. The work builds on the idea that “through CSUN, we all rise,” and focuses on the many ways that CSUN fuels the regional economy, elevates the community and yields stronger returns. Raising CSUN’s reputation and visibility was one of the central recommendations of CSUN’s Special Task Force on Engagement. The CSUN Foundation embraced this recommendation and helped support the visibility campaign development and launch.